Harry Speight's classic book on the area, 'The Craven and North West Yorkshire Highlands' beautifully describes the now little-known burial chambers and cairns in what he refers to as 'The Field of the Dead.' On Boxing Day 2012 I decided to go and have a look for myself - parking near the wooded hamlet of Stackhouse and climbing up onto the fell near 'the Happy Valley.' As I expected, these features are difficult to find, but once you do find them, they will stay with you. There's a wonderful sense of being in another age in this silent landscape. I actually missed the first features and had to turn back to look for them - but this burial mound is an obvious marker to the rest. It is marked on the OS map as a 'Cairn' at SD805665. As with many barrows in the area, the lie of the landscape has been utilised. I am not 100% certain if this barrow has ever been excavated. Certainly it appears undisturbed, and because early OS maps refer to this field as 'Sheepscar' - I call it 'Sheepscar Chamber.' Warrendale Knots can be seen on the skyline to the right. This is a view of the chamber looking east. Construction has taken place around a natural limestone outcrop. Close by - just behind and to the left as we look at the chamber - there is an overgrown but obvious 'circle' with the remains of a central 'cist' which was possibly a place of sacrifice. The circle is hard to show on photographs, but I will have a go! The central cist is the tiny stone protruding through the turf in the centre foreground. Reverse back on your computer chair - as distance allows the raised circle to show itself - though it is easier when you are there - believe me. I was very pleased as I was unaware of its existence and so 'discovered' it for myself - confirming my suspicions by reading the Megalithic portal. I adore these mystical places. This is a view of the 'Field of the Dead' with Sheepscar Chamber on the left and Sheepscar Enclosure - a walled burial mound in the centre. The tiny slice of limestone pavement you can see at centre is perfectly semi-circular around the mound - a give-away that this is, in fact, a work of man. 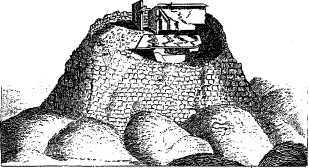 This, known as 'Sheepscar Enclosure' is easily seen on Google Earth as a kidney-shaped mound with a the limestone 'wall' enclosing one side. Apologies for the dull picture - but it was typical Christmas weather. 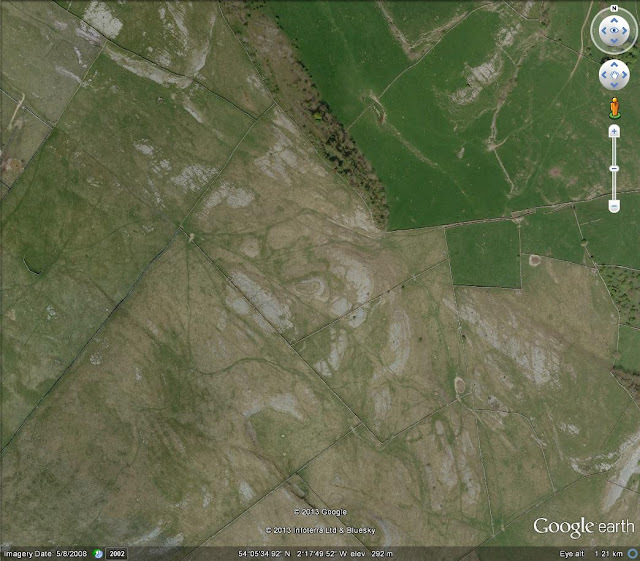 The Sheepscar Enclosure can be seen at the exact centre of this image above the obvious 'v' shape formed by the two converging walls. The semi circular formation of limestone can be seen around it looking rather like a question mark. 2 cm north west on the picture and the paler Sheepscar circular chamber can be made out. The lush green valley opening up at the top of the picture is the 'Happy Valley' - a place with an echo that has to be heard to be believed. Here I am standing on the central cist of the Sheepscar Enclosure looking a the perfect curve of the surrounding limestone. That's Stainforth Scar just behind, clothed in trees. This is a wonderful place to bury your loved ones - if indeed they were loved! The same position looking north, The kidney shape of the mound I'm standing on can clearly be seen - with the enclosing limestone to the right. Sheepscar Chamber is at top right. (SD806665) The OS map doesn't name this feature, but look carefully at how they've drawn the map and you can see the circular shape in the rocky outcrops. The hole in the foreground may well indicate past excavation. Nowadays - the most obvious feature is a large slab in the centre that has clearly once been part of a stone coffin for somebody of importance. Here the stone slab and the central depression can be seen clearly. It's in a bad state of repair, but what a great feature - and one of the few neolithic sites in the Dales at some 3000 years old or more. In fact, the more you look at the surrounding landscape, you do get the impression that there are nothing but dead bodies up here! There's also always one of the Three Peaks not far away. Here's The Apronful of Stones with Penyghent in cloud. A forbidding sight. And here's our last look at the massive mound. There are many other fascinating prehistoric features in the area - and we shall be visiting them all during the course of the year. Why not get out the map and go and see them for yourself? It's a rewarding half day's adventure.